The Netherlands are famous for several things – but windmills, cheese and tulips are probably the best known products from this country. Of course, Fluwel considers tulips to be the most important. 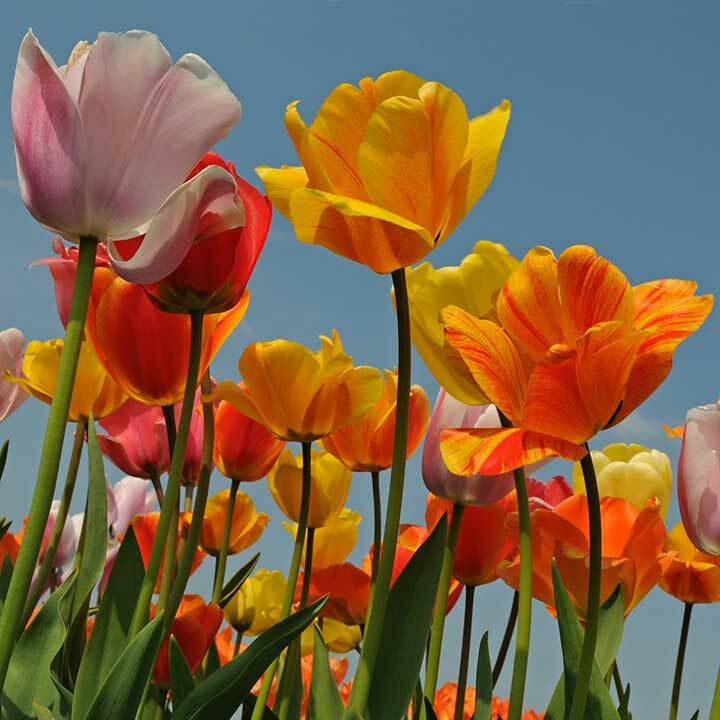 The Dutch tulip growing industry is large and competitive, so we are proud to be one of the best. Tulips may not originate in the Netherlands, but they have certainly become a central part of Dutch heritage through the years. Tourists from all over the world come to our little country to admire our tulip fields. Tulips and tulip bulbs are important export products also. So it is perhaps unsurprising that we have developed countless different tulip varieties to ship all over the world. We sell tulips wholesale to international companies, but we also cater to gardening enthusiasts. This online shop is designed for gardeners looking to for tulip bulbs to plant in their flower beds. We have an extensive collection of tulip varieties in different colours, sizes and shapes. Tulips are the most popular type of flower bulb sold on Fluwel.com. All bulbs are carefully selected by Fluwel experts, both by their looks and their potential. This is why Fluwel only offers the largest tulip bulbs that we know will perform well in the garden. Most common issues that gardeners encounter when planting and caring for bulb flowers can be resolved either using the information on or website, or asking our customer service. Of course, bad luck can happen and sometimes a bulb will fail, but this is uncommon. Perhaps the best thing about our tulip bulbs, is the good value for money we offer. We take care to price our bulbs fairly and reasonably. This means that anyone can enjoy beautiful tulips in their garden, even on a lower budget. Of course, there are price differences between different kinds of tulips. Some varieties are rare or tricky to grow, which means they cost more. Fluwel takes pride in knowing as much about tulips as possible. This is why we also have an experimental garden and even an informative theme park about bulbs! We test all of our bulbs in our gardens to ensure that they will perform well. This also gives our customers a the possibility to visit and see our tulips and other flowers in real life. Because of course we have many other flowers in addition to tulips. It is impossible to know where to start telling you about all our different types of tulip. If we talked about each and every type of tulip bulb in detail, we would probably end up with a lengthy novel. As much as we love tulips, we can understand that you would not want to read all of that. But we can tell you that Fluwel has tulips in all shapes, sizes and colours that you could possibly imagine – and perhaps even some that you couldn’t! Despite having worked in the tulip industry for so many years, even we are surprised sometimes. To create an overview, we have divided our tulips in several subcategories. This makes it easier for find what you are looking for. 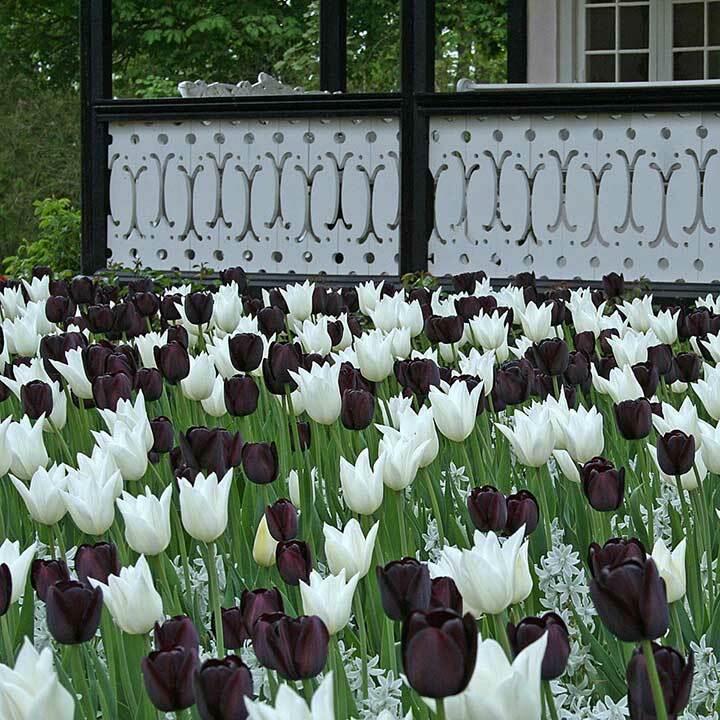 For example, if you like modern Dutch tulips, the main category is probably the best place to start. You can also filter between low-growing tulips and tall, large tulips. 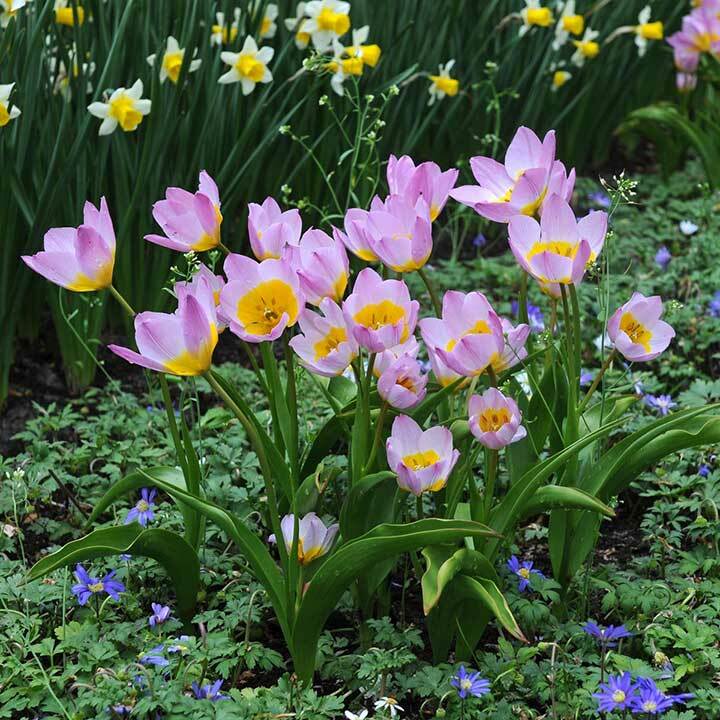 If you are looking for tulips that are more unique, take a look at the category ‘Wild and Miniature Tulips’. Because the tulip bulbs we sell are all so different, they also have their own unique soil requirements. So make sure you read the provided information on each type you plan on ordering. Some kinds will prefer lots of water and partial shade, while others will want less water and full sun. Planting tulip bulbs is still a similar process, so we also have general information about planting tulip bulbs available. Maybe it seems strange to order plants online instead of picking them up at a garden centre. After all they are living things! Bur ordering your plants and bulbs online truly only has advantages. Especially when you order from, as we ship all flower bulbs in time for the planting season. And of course ordering your new bulbs from home simply will save you a lot of time. So save yourself the hassle of driving to the garden centre and order your bulbs straight from the specialists at Fluwel. Fluwel is committed to delivering high quality flower bulbs. Each type of tulip (of any other flower for that matter, such as daffodils or hyacinths) is tested out in our experimental garden to see how it will perform. Any varieties that do not bloom predictably or are tricky to grow will simply not be sold in our online shop. This is why you can always depend on our bulbs to perform well when planted in your garden. Our tulip bulbs cannot be ordered all year round. This is simply because tulips have a yearly cycle of being planted, flowering and then withering. This pattern cannot be changed. So tulips must be planted in the autumn, before the frost sets in. Tulip bulbs will always do better if they spend a winter in the ground. So we encourage you to plant your tulips in early autumn or even late summer. As soon as tulip bulbs are available in our shop, feel free to place your order and we will deliver them as quickly as possible. Feel free so sign up for our newsletter to keep up to date on bulb availability.